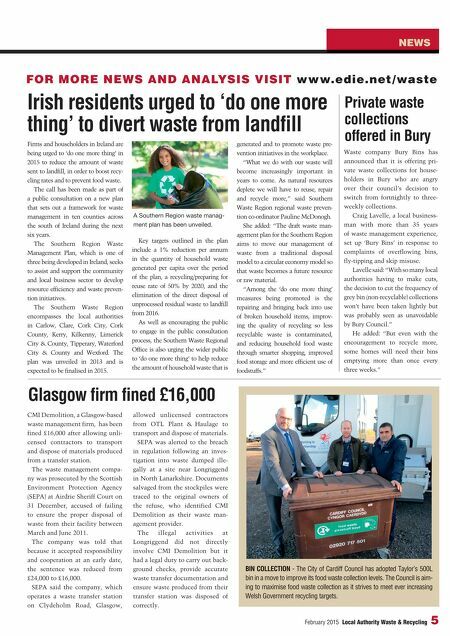 NEWS February 2015 Local Authority Waste & Recycling 5 FOR MORE NEWS AND ANALYSIS VISIT www.edie.net /waste CMI Demolition, a Glasgow-based waste management firm, has been fined £16,000 after allowing unli- censed contractors to transport and dispose of materials produced from a transfer station. The waste management compa- ny was prosecuted by the Scottish Environment Protection Agency (SEPA) at Airdrie Sheriff Court on 31 December, accused of failing to ensure the proper disposal of waste from their facility between March and June 2011. The company was told that because it accepted responsibility and cooperation at an early date, the sentence was reduced from £24,000 to £16,000. SEPA said the company, which operates a waste transfer station on Clydeholm Road, Glasgow, allowed unlicensed contractors from OTL Plant & Haulage to transport and dispose of materials. SEPA was alerted to the breach in regulation following an inves- tigation into waste dumped ille- gally at a site near Longriggend in North Lanarkshire. Documents salvaged from the stockpiles were traced to the original owners of the refuse, who identified CMI Demolition as their waste man- agement provider. The illegal activities at Longriggend did not directly involve CMI Demolition but it had a legal duty to carry out back- ground checks, provide accurate waste transfer documentation and ensure waste produced from their transfer station was disposed of correctly. Glasgow firm fined £16,000 Irish residents urged to 'do one more thing' to divert waste from landfill Firms and householders in Ireland are being urged to 'do one more thing' in 2015 to reduce the amount of waste sent to landfill, in order to boost recy- cling rates and to prevent food waste. The call has been made as part of a public consultation on a new plan that sets out a framework for waste management in ten counties across the south of Ireland during the next six years. The Southern Region Waste Management Plan, which is one of three being developed in Ireland, seeks to assist and support the community and local business sector to develop resource efficiency and waste preven- tion initiatives. The Southern Waste Region encompasses the local authorities in Carlow, Clare, Cork City, Cork County, Kerry, Kilkenny, Limerick City & County, Tipperary, Waterford City & County and Wexford. The plan was unveiled in 2013 and is expected to be finalised in 2015. Key targets outlined in the plan include a 1% reduction per annum in the quantity of household waste generated per capita over the period of the plan, a recycling/preparing for reuse rate of 50% by 2020, and the elimination of the direct disposal of unprocessed residual waste to landfill from 2016. As well as encouraging the public to engage in the public consultation process, the Southern Waste Regional Office is also urging the wider public to 'do one more thing' to help reduce the amount of household waste that is generated and to promote waste pre- vention initiatives in the workplace. "What we do with our waste will become increasingly important in years to come. As natural resources deplete we will have to reuse, repair and recycle more," said Southern Waste Region regional waste preven- tion co-ordinator Pauline McDonogh. She added: "The draft waste man- agement plan for the Southern Region aims to move our management of waste from a traditional disposal model to a circular economy model so that waste becomes a future resource or raw material. "Among the 'do one more thing' measures being promoted is the repairing and bringing back into use of broken household items, improv- ing the quality of recycling so less recyclable waste is contaminated, and reducing household food waste through smarter shopping, improved food storage and more efficient use of foodstuffs." Private waste collections offered in Bury BIN COLLECTION - The City of Cardiff Council has adopted Taylor's 500L bin in a move to improve its food waste collection levels. The Council is aim- ing to maximise food waste collection as it strives to meet ever increasing Welsh Government recycling targets. 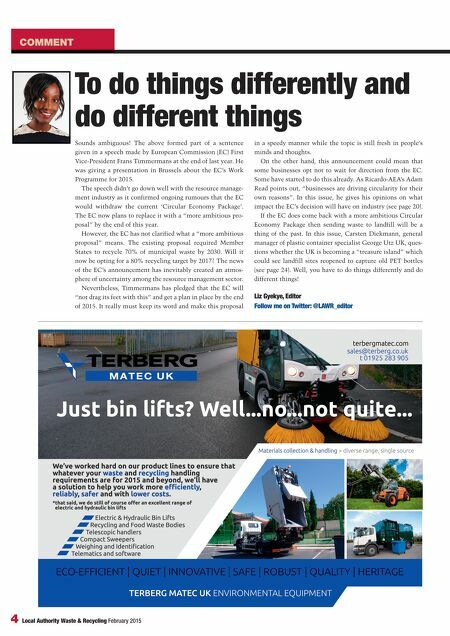 Waste company Bury Bins has announced that it is offering pri- vate waste collections for house- holders in Bury who are angry over their council's decision to switch from fortnightly to three- weekly collections. Craig Lavelle, a local business- man with more than 35 years of waste management experience, set up 'Bury Bins' in response to complaints of overflowing bins, fly-tipping and skip misuse. Lavelle said: "With so many local authorities having to make cuts, the decision to cut the frequency of grey bin (non-recyclable) collections won't have been taken lightly but was probably seen as unavoidable by Bury Council." He added: "But even with the encouragement to recycle more, some homes will need their bins emptying more than once every three weeks." A Southern Region waste manag- ment plan has been unveiled.